SharpShooter Collection is distributed as a Microsoft Installer package. The name of the installation package file is SharpShooter Collection.msi. To install the software, run this file and follow instructions of the wizard. If during setting installation you chose the "Add components to Visual Studio Toolbox" option, the SharpShooter Collection components will be automatically added to the Microsoft Visual Studio .Net Toolbox. In a different way, you can add the SharpShooter Collection components onto the ToolBox manually. For your convenience we recommend to create a separate tab for every product. To do it, start Visual Studio, right-click on the ToolBox, select the Add Tab item from the context menu, enter the name of the tab (for example, SharpShooter Reports) and press Enter. After that you should add components to the created tab. Open it by clicking on it with the left mouse button, use the right mouse button to open its contextual menu and select the Choose Items item. After that you will see the dialog box shown below. To sort the list by namespaces (the namespaces of all components begin from PerpetuumSoft), click on the Namespace column header. 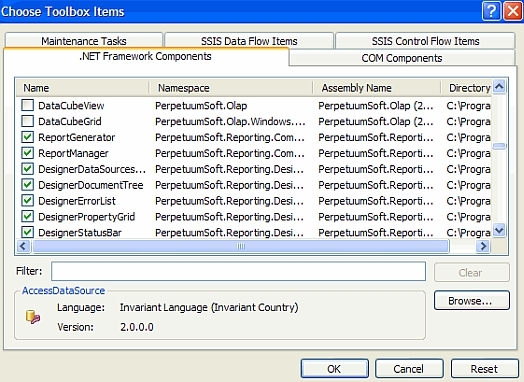 Then select the following components: ReportManager, DesignerDataSourceTree, DesignerDocumentTree, DesignerErrorList, DesignerPropertyGrid, DesignerStatusBar, DesignerToolBar, DesignerToolBox, ReportDesigner, CSVExportFilter, ExcelExportFilter, ExcelXMLExportFilter, BitmapExportFilter, EmfExportFilter, GifExportFilter, JpgExportFilter, TiffExportFilter, HtmlExportFilter, PdfExportFilter, RTFExportFilter, ReportViewer, SharpShooterWebViewer and click “OK”. To use SharpShooter Gauges in Visual Studio you should add the following components onto the ToolBox: IndicatorWidget, Widget, WidgetHolder, WidgetProducer, OPCChannel, and OPCConnection. To use SharpShooter OLAP, add these components: DataCube, DataCubePrintDocument, DataCubeGrid, DataCubeView. SharpShooter Dashboards use requires the ChartViewer component added to Visual Studio ToolBox. 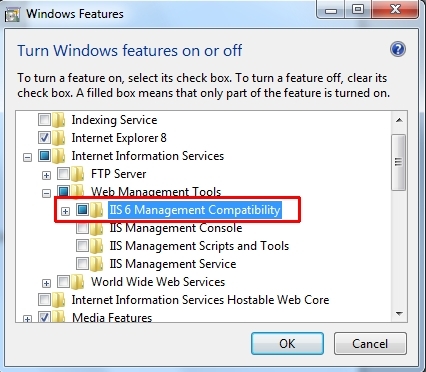 1) Make sure that the installation is launched with administrator permissions. 4) Check if there any error messages in Event Viewer (Control Panel -> Administrative Tools -> Event Viewer, then follow to Windows Logs -> Application section). You can save this log to a file and send it to support@perpetuumsoft.com or submit a ticket. Our Perpetuum Support Team will try to find out how to solve this problem. After installation send file installog.txt to support@perpetuumsoft.com or submit a ticket. Our Perpetuum Support Team will try to find out how to solve this problem. 6) If the information above doesn't help, you can try to install the product on another machine and then copy the files to the computer you need. 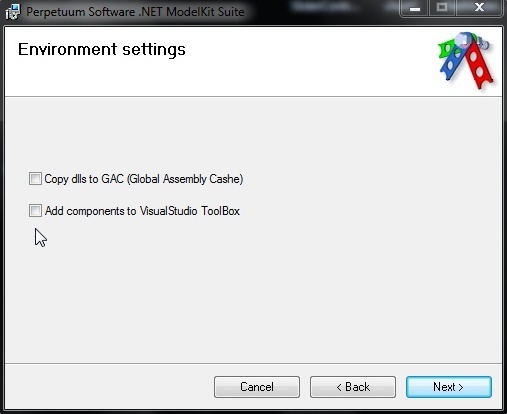 Then you can add DLL files to GAC and Perpetuum components on the Toolbox in Visual Studio manually.